A Heartbroken "El Chapo" Requests A Hug From His Wife During Trial. Moral disengagement is a crazy thing. Who would have thought that a druglord with thousands of hits on his kill count had a sentimental side he reserved for his better half. Emma Coronel Aispuro, the woman who's stood behind through thick and thin, is at heart of the most recent court injunction in the US Government's federal case against extradited kingpin Joaquin "El Chapo" Guzman, on charges of plotting the international drug trade beyond Mexican borders. 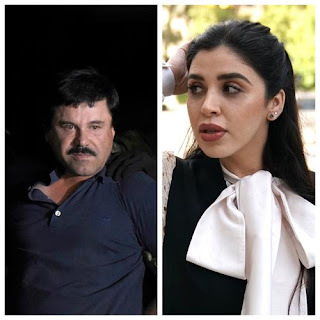 "El Chapo" has one simple request above all when it was his turn to address the judge presiding over his trial: the embrace of his wife Emma Coronel Aispuro. According to official court documents, "The only human contact Mr. Guzman has had since his extradition has been with the jail personnel when putting and removing his shackles, and a quick handshake from his attorneys when he goes to court." In other related news, a member of the grand jury was barred from completing his responsibilities after showing himself biased. The would-be juror admitted during the selection process that he had sought an autograph from the infamous kingpin. According to NBC News, a Michael Jackson impersonator was also eliminated from jury selection, for posing a serious threat to the legitimacy of the case. The judge has yet to rule yay or nay on Guzman's request for a hug.